Meet THE BEAR - a cat who carries the weight of the world on his furry shoulders, and whose wise, owl-like eyes seem to ask, Can you tell me why I am a cat, please? Like many intellectuals, The Bear would prefer a life of quiet solitude with plenty of time to gaze forlornly into space and contemplate society's ills. Unfortunately he is destined to spend his days surrounded by felines of a significantly lower IQ . . .
RALPH: handsome, self-satisfied tabby, terrified of the clothes horse. SHIPLEY: mouthy hooligan and champion mouser, rendered insensible by being turned upside-down. ROSCOE: fiercely independent kitten, tormented by her doppelganger in the mirror. And then there's Tom, writing with his usual wit and charm about the unexpected adventures that go hand in hand with a life at the beck and call of four cats . . . or three cats and a sensitive poet who just happens to be a foot high and covered in fur. So I was inspired to read The Moggy Series by @MYSADCAT on twitter. 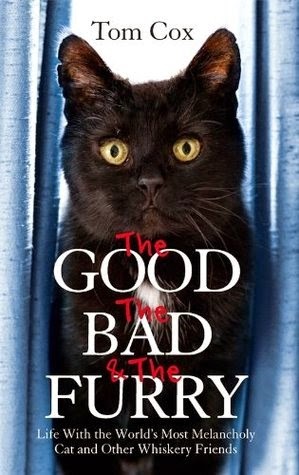 The photos of The Bear often look so like my Gypsy Cat :) The book wasn't quite what I was expecting tho,and although there are some amusing bits, overall it's just a story. I'll still give the rest of the series a try tho.